After 3 days in Barcelona, we took a short two hour flight south to Granada where we spent the next two days. Granada is much smaller than Barcelona and incredibly charming. The city is located at the foot of the Sierra Nevada mountains and boasts a population of just over 230,000 in it’s city proper. It’s most notable for the Alhambra, an Arab citadel and palace, which is exactly where we began our visit. The Alhambra which began it’s construction in 889 AD with additions dating up to the 1500s is oozing with Islamic architecture making it stand apart from many of the other palaces we’ve toured. While touring the palace you can really see and feel the Moorish influence. The Alhambra is incredibly rich in history and beautifully maintained. After touring the inside we spent just as much time outside walking the palace gardens. 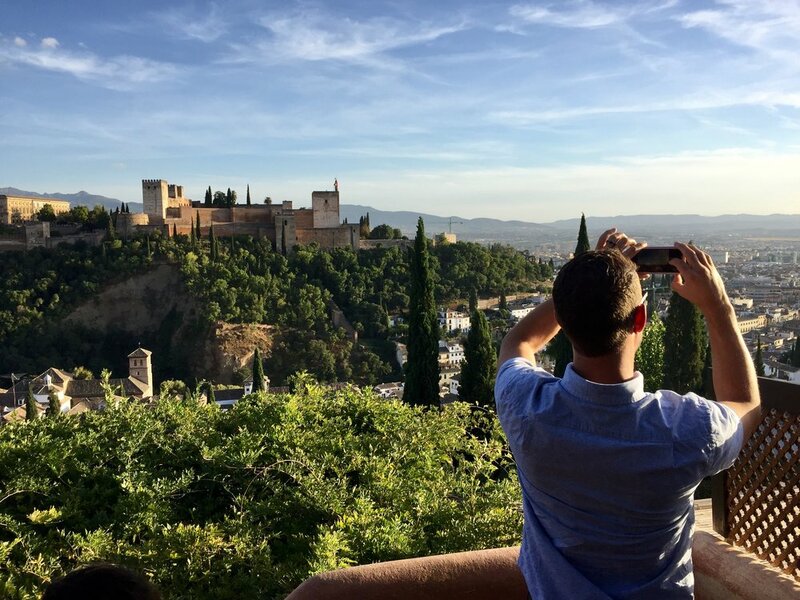 If you’re looking to book a pass to the Alhambra, we recommend getting the Granada Card which gives you access to not only the palace, but also to many of the other main city monuments and public transportation. After nearly 3 hours touring the palace and gardens, we found a place for drinks and paella (we never grew tired of it!) and later retreated to our Airbnb which we all later agreed was our favorite place of the trip because… location location location! 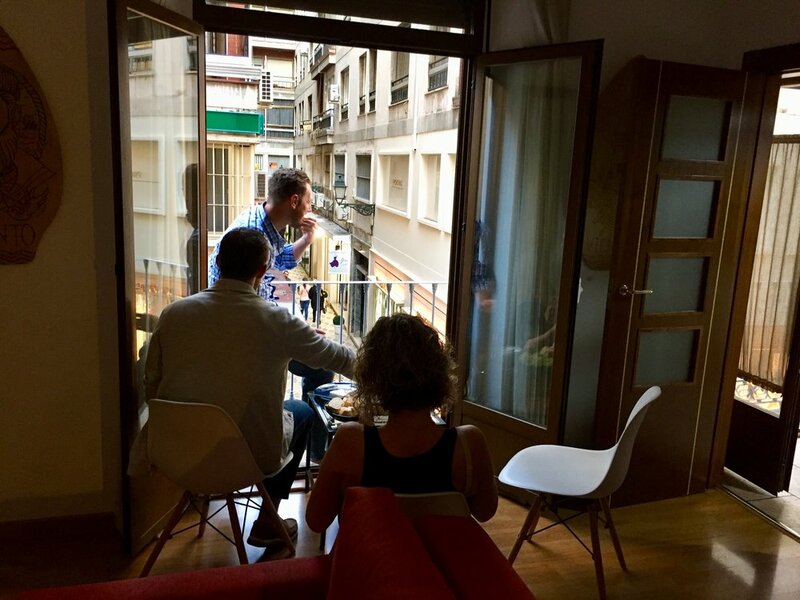 Our living room doors opened up to a series of small balconies the street one floor below and it was the perfect atmosphere for happy hour before dinner. That night we did some bar hopping and discovered a very important thing about the city of Granada: with every drink your order (bar, restaurant or otherwise) it is customary for you to also be provided with a small bite to eat. So, as we ordered our first round of drinks you can imagine our confusion when they also placed a coated appetizer in front of us. “We didn’t order that,” which made the server giggle. Needless to say, we never ended up ordering an actual dinner while in Granada. Our second day in Granada Jeff planned a long hike through the Sierra Nevada mountains using a blog recommendation Jeff had found. We stopped at a street side vendor for some apples and nuts for the trail and then hopped on a bus that took us 10 miles out from the city where the idea was to be dropped off and hike back into the city. The day was gorgeous (and hot!) and I was pretty happy I chose to wear sunblock and comfortable shoes. The view was breathtaking and it was a good change of pace from the bustling city scene we’d been living in the last few days. Around the 2 hour mark we started descending the mountain and happened upon a small town called Dubar, which was odd because the blog never mentioned Dubar in its guide. It wasn’t until that point that we realized we had been hiking in completely the wrong direction. Same sights, different part of the mountain! 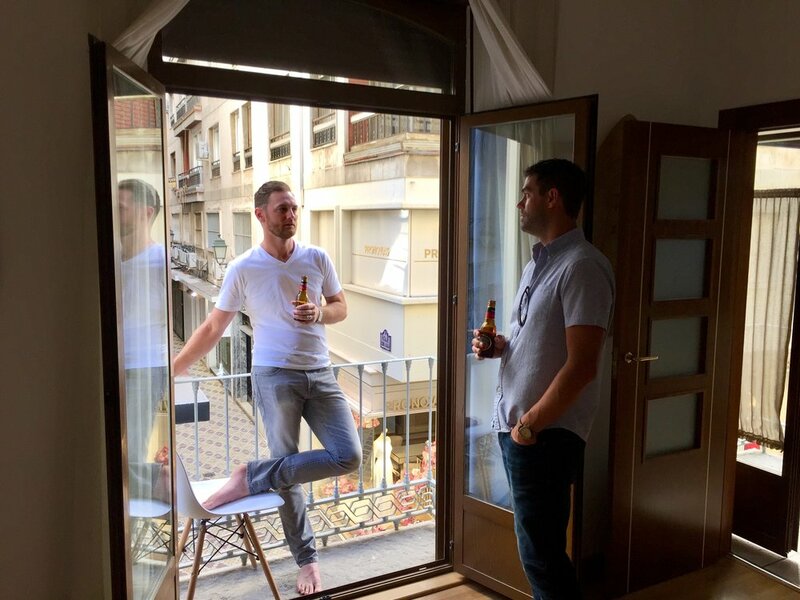 And in true vacation form… we laughed about it and found the only bar in town for wine, beer and the complementary tapas. After some investigation we discovered the bus ran a route through Dubar once an hour which was exactly enough time for us to finish our drinks and happily ride the rest of the way back to Granada. The best hike ever. After a long siesta we saw a few more Granada sites including The Royal Chapel and the Cathedral. Both were accessible using our Granada Card. And the rest of the evening is what our travel dreams are made of. While some live for the sites (the palace tours, the museums, etc. - which for the record I also love), we seek the ‘moments’ that come with traveling together and with friends. After hiking to the very popular lookout point Mirador de San Nicolas, we waited in line for a spot at Restaurante El Huerto de Juan Ranas - Thanks again Rick Steves. A glass of red wine in hand overlooking the Alhambra palace grounds, we sat together watching the sun set over Granada. Nate took an impressive amount of photos and I got chatty with the European empty nesters sitting next to us who didn’t speak a lick of English. It was perfect.